The Uller (Clan designation Kit Fox) is a very adaptable and quick Clan Light Mech. 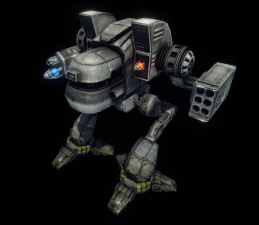 Though all of its variants pack a surprising amount of firepower for a its size, the Uller is much easier to kill than other Lights due to carrying the least total armor of any mech and a more exposed Cockpit and Center Torso, although changes to the model have improved its hitboxes over the versions. Some of the Uller's variants are available at the beginning of a match, and make excellent choices for both experienced and new players that can respect its glass cannon nature. 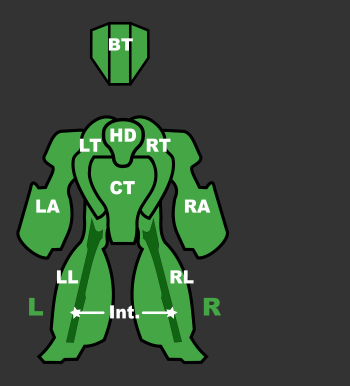 Its arms are especially valuable targets as they have a prominent hitbox and carry its main weapon(s), so pilots are bound to have the frustrating experience of losing an arm and being rendered functionally ineffective. The Uller Prime is a formidable brawler, with the ability to damage enemies at longer ranges. With a weapons array consisting of a CERLBL, LBX5, SRM6 and a pair of CERSBL, it's easy to consider this a schizo variant and shy away, but its use is not that complicated. The Large Laser and LBX autocannon can shoot at enemies up to 900m and 800m away perspectively. This might not be enough firepower to make fighting at range viable, but it's capable of softening up approaching brawlers and forcing longer range assets to consider taking cover as you close in, or dealing the finishing blow to a fleeing enemy. At close range the Uller Prime is capable of bringing all of its weapons to bear, with only the missiles needing any involved leading as landing the lbx becomes trivial. Two DHS keep things cool, the large laser causing the only appreciable heat spikes. Being afforded no free tons, pilots will find their SRMs running dry after prolonged skirmishes. The A variant is centered around one of the hardest hitting weapons around, the CGauss. The CGauss is absolute death to Light Mechs, and can be used effectively at mid- to long-range. It also packs enough of a punch to threaten heavier Mechs. The 2 CERMBLs are there to supplement mid-range firepower. To give the Uller A some anti Battle Armor abilities, it carries B-Pod. If the CGauss arm is lost, however, the Uller A loses most of it's damage output, so care should be taken to protect the CGauss. Also, without a small CBill donation from a teammate, it is impossible to use an Uller A at the start of the game. The Uller B is similar in concept to the Solitaire D: a small, fast mech boasting one very big and very dangerous gun. Its CUAC20 can easily shred light Mechs with some well-placed shots and is a serious threat to both medium and even heavy Mechs. Supporting the Ultra AC20 are two cERSBLs, which is capable of dealing the last few points of damage in order to score a kill. Unlike the Solitaire D, the Uller B carries a GECM, which helps compensate for its vastly lower speed. Using the extra available ton for Ultra AC20 ammo is highly recommended, as without the main gun the B becomes little more than a pushover in combat. It is also vital to protect the B's cannon arm for this reason. Famed for its use in early rushes under Cloud Cobra in pre-0.7 releases, the Uller C is now a considerably more expensive mech at 45,000 c-bills. The C can put out massive damage over a short period of time and can engage it's enemies very quickly using MASC. The C boasts 4 DHS which is quite appropriate considering the fact that it has 4 CMPLs and MASC. Even so, the C tends to overheat, especially when using the MASC. The 4 CMPLs allow the C to place pinpoint damage onto specific targets. There are few light mechs that can compete with it's ability to slice off arms or melt off an external rack of missiles. The C's 2 MGs don't put out much damage, but they can be somewhat useful for shooting at BA or aerospace. As an energy-based mech with an extra ton and a half of armor, the C should be able to stay out in the battlefield for long periods of time, but it has a relatively short range coupled with high heat weapons making frequent trips to repair bays a necessity. All 4 of the C's CMPLs are in it's arms making the C's arms priority targets for it's enemies. Mechwarriors piloting the C should take extra care to protect their arms. The Uller D is a is a sniping mech capable of inflicting precise damage at long-range. With it's CERPPC reaching out to 900m followed by a single CUAC5 range within 800m - 900m. Good positioning is a must due to the long recharge time of the CERPPC and the cool down of the CUAC5. Two CERSBL provide a punch at 450m good for finishing off crippled units and fighting off BA. Uller D also comes equipped with 2x LAMS to shoot down any enemy Missiles and Artillery that fall into its range. Housing only 1 DHS pilots still need to watch the heat spikes. 5t Armor makes it one of the lessor armored units. Uller D should be used as a sniper or fire support but never a brawler or scout. The Uller E is one of the most formidable starter brawlers. Equipped with a reliable up to mid-range LBX10, a large DSRM4 launcher and a trio of SPL boasting enough firepower that calling them backup weapons doesn't do them justice, it boasts the highest DPS potential amongst starters while still opening with a devastating alpha. Its stellar firepower doesn't mean it doesn't come without weaknesses, though. Being an Uller means it's lightly armored, despite being one of the better protected variants, while not having enough speed to choose its engagements, especially compared to other starters. The nature of its small pulse lasers means it will have to keep its torso exposed in order to maximize its damage dealt, and carrying no extra DHS, despite being relatively cool, makes prolonged engagements a tough proposition. Being unable to carry any extra ammo, pilots need to be aware of their remaining shots, as the missiles will run out after twelve salvos and the lbx carries just twice that amount of shells. At exactly 43,000 c-bills, the Uller F is a reasonable starter Mech. Its weapons are not quite as formidable as the Uller C dps-wise, but its HLL can deal a significant front-loaded strike provided the pilot can accurately land it for its full duration. Its armor is significantly weaker, but it's heat management is much easier to handle. That being said, the Heavy Laser by itself can cause shutdowns on hot maps. Chainfiring its packs of SSRMs, an arm mounted six and two torso mounted twos for a total of ten(! ), can keep an enemy constantly rocking from the impacts while helping keep heat under control. Pilots shouldn't be misguided into thinking this variant is a brawler, as its flimsy armor and the nature of its weapons make it most suited to tearing apart distracted opponents, entering the fray just as the vanguard units have committed to their targets, barraging targets with missiles and finishing off damaged sections with its laser. In a straight fight it can be easily taken down, as even competent attempts at spreading damage will lead it to inevitably losing an arm early in the engagement and having its firepower severely diminished. Formerly a lightly armed sprinter, the Uller G is now a long-ranged fire support mech. Built around a pair of arm-mounted cLRM15s, the Uller G is a dangerous early-game missile boat. In order to purchase one, a small donation from a teammate is necessary. 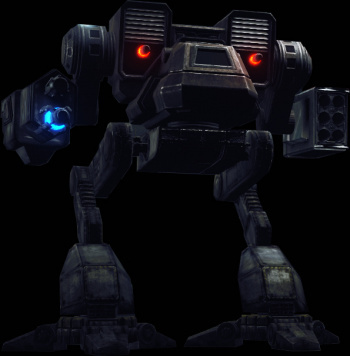 In conjunction with a spotting Mech such as a Raven or Owens, the G can set up behind cover and rain barrages of LRMs that few other light Mechs can match. Two cERMBLs add extra punch against closer enemies or when the G's relatively meagre ammo supplies are exhausted, as it cannot carry extra ammo with it into battle. B-Pod helps with finishing off wounded Battle Armor if they get too close. The Kit Fox is a light Clan OmniMech with long-range combat as a primary focus, earning it the Inner Sphere codename of Uller, after the Norse god of archery. The Kit Fox was another light OmniMech designed by Clan Cloud Cobra, and was first produced in 2890 with the aid of new resources coming from the Tanite Worlds. Rather than emphasize speed, the Kit Fox emphasizes armor and firepower, complementary to the role of the Fire Moth.